I took an unintentional blogging break… I guess partially because life is super busy and partially because I don’t have a super strong desire to blog. This semester, Josh is taking a Biblical Counseling class and I am going to try to read the material so we can talk about it. I have my Bachelors in Psychology, and I believe in a balanced, holistic, integrated approach. I think there are good, beneficial Biblical Counselors, but I don’t believe the Bible-only approach is the most effective. I am super interested to see where Josh’s professor comes down on the scale, and to be able to discuss the course with him. So… it’s been two weeks. How did my to-do list work out? I wanted to make Carrot Cake Cheesecake, but I need to buy some cake pans and I already used up the “Household” budget this month with curtains and such. So instead I made Monster Cookies! Obviously there were no complaints in the house… and I made extra to take to our friend’s “welcome back” party since he was unexpectedly gone for like the entire summer. I also made rolls! I’m not sure what happened, but I had to add a TON of flour. I was so sure they were going to be a flop…. but they were delicious. I also made an Apple Cake this weekend. -Have someone over for dinner. In the past two weeks, we have had a lot of people over! We had Joe Tom over one night, and my long-lost Capernwray friend Derek over the next. It was so fun catching up with both of them, and so nice for Josh to finally meet Derek. This past week, we did breakfast for dinner with other friends. THAT WAS SO FUN. We don’t usually have people over for breakfast food… but it was awesome- and a combined effort! We made pancakes and had strawberries and our friends brought sausage and orange juice. I still have more to do, but I made a ton of progress! The kitchen stuff is unpacked, the pictures are getting hung up, things are finding homes. -Hang some pictures/brainstorm where pictures will go. On Monday night, Josh and I decorated the study! I have been telling Josh that “when he has an office” he could hang up the stuff he has from his trips, and his Redskins pictures. So, true to my promise, I helped him hang up stuff from his trips and created the study he’s been wanting. I have my desk in the room as well, so I have my own wall! 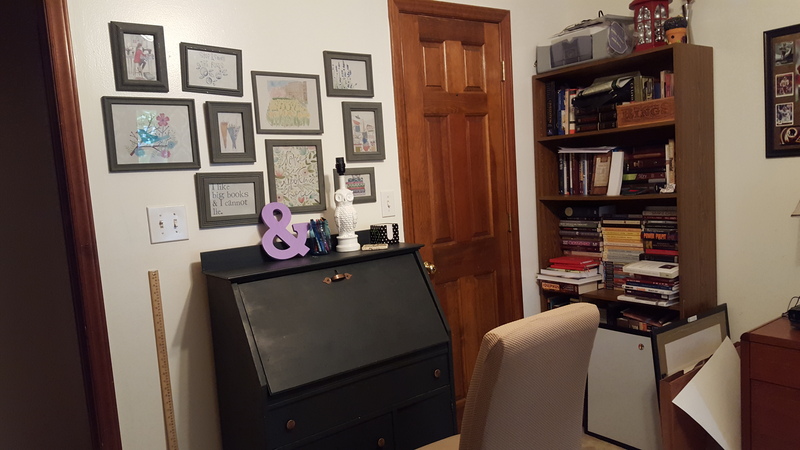 It’s fun to have our own spaces in the same room… they are so distinct and unique. I have been reading the second Hunger Games book! I am reading a few “serious” books, so it’s nice to have one that I am able to use as an escape and just enjoy. -Family time, maybe a movie night? Update on my purchases, I got my dress and it’s perfect! I feel like it’s a great dress to transition through seasons… it’s classic by itself but will also look so cute with boots, a cardigan and tights moving into Fall. I say, $14 well spent. 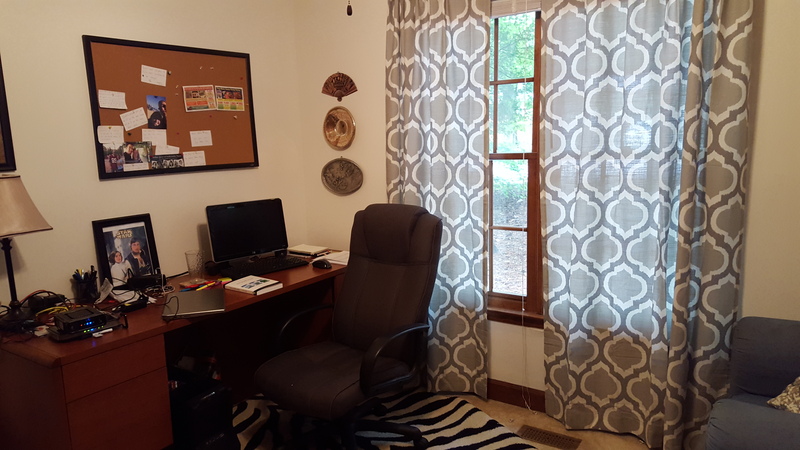 The curtains arrived, and finished off our office space! Here’s some pictures of our almost-finished office space below… we’re so excited about it. Two Wednesdays ago, Josh and I went to Chipotle for date night and he went to the fabric store with me after. Our friends in growth group are having a baby, so naturally I went to JoAnn fabric. 🙂 I am SO excited about this project. It feels really good to have another project… and I love making baby things. I feel like I get to be part of the joy and excitement, and it’s a way for me to take my thoughts off myself. As I pick out fabric, sew the pieces together, and admire the finished product, I’m praying for my friends as they are entrusted with this precious soul. I’m praying for the baby, that they will grow up to honor and love Jesus with their whole heart. I pray for people to encourage my friends in each season of parenting. I love doing this way more than picking out the fabric (though I picked this fabric out because I feel it has real meaning)… for me it’s a way to love and serve. And, like each child, every blanket I make is unique. Life is full. I feel like there isn’t enough time to rest, get all the chores done, make all the meals, and be a good friend. I feel like no matter what I do, something is going to suffer. This week, it’s the chores… but they needed to be ignored. I need to make sure I’m making time to do things that will refresh me (like baking a cake or buying fabric or making this place a home and spending time with the Lord), or it won’t matter how much time I’m spending with others… I won’t have anything to give. This week’s date night is going to be a Josh’s birthday celebration! 🙂 His birthday is actually Friday, and we’re going to celebrate with my family this weekend. Gosh, have I mentioned how happy it makes me that my family LOVES Josh? It’s seriously the best. It makes me so happy to see the people I love loving the person I love most. 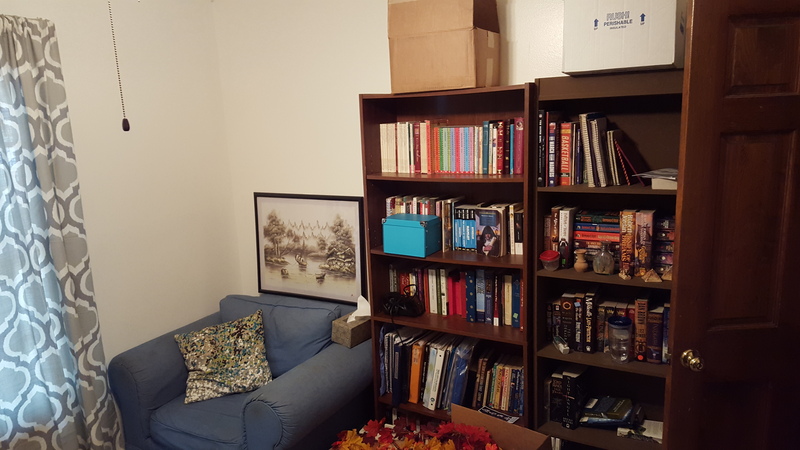 I am excited our house is starting to come together… I love our study! I’m so excited you finally have your space to do homework. Thanks for all you’ve done to pick up my slack the last few weeks. I’ve been thrown for such a loop and I’m so thankful for you starting crock pot meals, going on walks with me, and doing laundry. I’m looking forward to celebrating your birthday tomorrow and this weekend!